The tipping point. Another afternoon of weekday drudgery that could be picked up by the perfect brew. The cafe that knows your name, your order and seemingly your every need is closed (and good luck to them having been there since 5am). Internally you would try yourself for treason if you go to another. What next? Why is this such an issue? Surely one cup of the instant stuff supplied in the office kitchen won’t kill you will it? The answer is no but it sure almost felt like it. I have nothing against a large multinational making cheap instant coffee, it is just that in recent years I have not been able to stomach this brand. I’m not even sure why. Instant coffee is instant coffee and you may say its all bad, and I don’t necessarily disagree, however typically I am fine with most brands when that is all that’s on offer – just not the blend ending in 43. So, I tempted fate and made a cup, consuming half. An uneasy feeling came ever me and the rest of the afternoon was spent feeling slightly ill. Rather than a little boost to my productivity, an afternoon of endless spreadsheets and a full inbox would now be dealt with on a background of vague nausea. Thus, the tipping point. If you wish to complain then do something about it, or if you choose to do nothing, then shut up and stop complaining – oh and it’s also advisable to never make another cup of that stuff. Complaining done. The action? A task entered into Omnifocus to investigate cold brew concentrates, as a number of articles had also come through my feed reader recently about cold drip brewing and concentrates. Time to fight back! The increase in recent articles on this topic such as those above, are largely due to the northern hemisphere summer, as many of the recipes focus on using the resulting brew in iced coffee mixes of varying types. However, the concentrate can be used equally well as a hot drink when mixed with boiling water. As I have noted above, the exact technique I used varied a little from the original article, however the main starting point being the ratio of coffee to water. Using the Aeropress to strain and filter the resulting mix worked well as the liquid dripped through the filter over about 45 minutes or so, with the plunger only used to push through the last 10% as the amount of sediment increased on the filter paper. Any fine cloth sieve technique would work equally as well. Though not perfect. For what I wanted? Absolutely spot on. The first thing you will notice upon tasting a cold brewed coffee is the absence of acidity, irrespective of whether you are consuming it as a hot or cold drink. This particular element of the flavour profile is generated by heating ground coffee in the usual types of brewing. Some people would therefore consider this as a little bland, or “missing something” in the cup. Obviously they are correct, the acidity is the missing element. The brew is one of the smoothest you will have tasted, and those looking for more ‘punch’, may need to play around a little with bean types, roast level and overall soaking or steeping times, which I plan to do in future brews to assess the results. 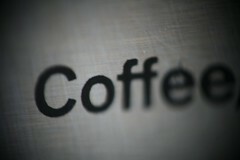 The varietal used for the current brew was a light to medium roasted Central American origin from El Salvador. I have found with other brewing methods this is a subtle origin with notable acidity, and I am therefore looking to experiment with some South American origins that will provide a little more body for future cold brews. The method I have outlined above provided 3 cups of hot coffee brewed at 1:1 ratio of water to concentrate and is certainly a technique I plan on continuing to use, because as we all know, few afternoons go by that could not be improved by a decent cup of coffee. Do I feel smug making my ‘instant’ brew this way? Only when in the office kitchen adding hot water and I see the jar with the dreaded number on it out of the corner of my eye. It may say 43, but I give mine at least an 86–90 out of 100 and definitely think you should give it try.